This guidance focuses on long-term contaminant management using institutional controls (ICs). ICs are a form of land use controls (LUCs) that provide protection from exposure to contaminants on a site. While ICs consist of administrative or legal restrictions on a site, LUCs can also use physical measures, which are called engineering controls (ECs). In contrast to ECs, ICs are primarily government controls, proprietary controls, enforcement or permit mechanisms, and informational devices. The guidance presented here builds on ITRC’s 2008 document Overview of Land Use Control (LUC) Management Systems and can be used to develop and improve long-term management programs for ICs. This guidance assists those who are responsible for stewardship of ICs by describing critical elements and best practices for an IC management program. Much of this guidance is based on the successes and lessons learned from established state and federal agency programs. ITRC surveyed state programs to better understand the types of IC management programs that are in place across the United States, what makes these programs effective, and what common issues affect the durability of ICs. 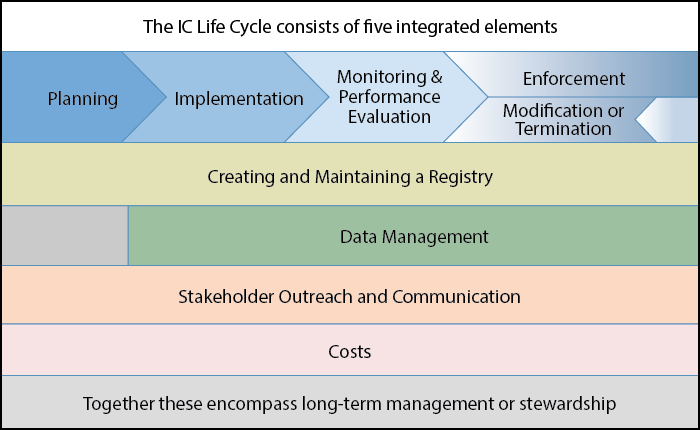 IC management programs often address the latter, stewardship phases of the IC life cycle described in the figure below. To assist with cost-effective program development, ITRC has developed a downloadable tool that can be used to document critical information about an IC. This tool can help to create a lasting record of the site that includes the regulatory authority, details of the IC, the responsibilities of all parties, a schedule for monitoring the performance of the IC, and much more relevant information. The tool generates an editable Long Term Stewardship (LTS) plan in Microsoft Word. If you are visiting this site for the first time, please review the Introduction. All users may find the Navigating this Web Site page helpful.